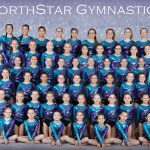 It was a successful weekend in Kalamazoo for the Northstar Gymnastics team for their first meet in 2018. Forty-two members of the XCEL competitive team participated in the Snow Fest Invitational, competing against 23 teams from around the state. Northstar earned the top two team scores overall, easily winning both the XCEL Gold and XCEL Silver divisions. Fourteen members of the Gold team contributed to a first place score of 112.425, claiming six of the top ten all-around scores as well. Silver gymnasts finished first out eight teams with a score of 112.400, also earning six of the top ten all-around scores. 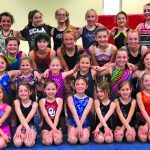 While hard work, dedication, and practicing 5.5-7.5 hours a week certainly contribute to their success, according to Head Coach Nikki Miller, the girls simply “love what they do and love to show what they can do.” Congratulations, Northstar gymnasts!